Whether you are a key worker tackling your Early Years Foundation stage or a seasoned professional looking to brush up on best practice and stay abreast of the most current thinking. 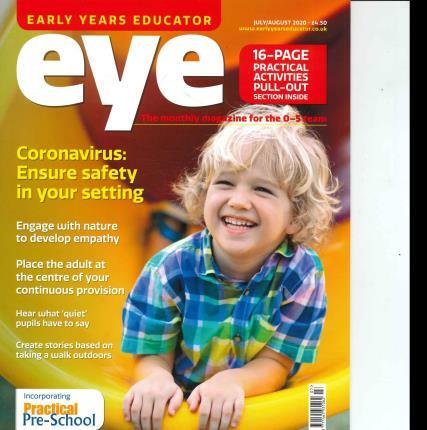 Buy a single copy or subscription to Early Years Educator magazine. If you consider yourself to be an early years educator worth your salt, nothing will help you to hone and develop your craft than an Early Years Educator magazine subscription. If you dread the site of dry textbooks, whitepapers and journal pieces, Early Years Educator is a breath of fresh air. Challenging, inspirational and practical in equal measure, it features ideas and projects that you can take straight into the classroom environment. Very useful magazine for early years practitioners. Interesting articles and useful resources.